Augusta, the second oldest city in Georgia, was founded in 1736 on the banks of the Savannah River and thrived as a trade and transportation hub. The 1901 purchase of the home of George Walton, one of three Georgia signers of the Declaration of Independence, is evidence of Augusta's early commitment to historic preservation. Since the early 20th century, many historic buildings in Augusta, including cotton mills, churches, and educational facilities, have been adaptively reused, including the Augusta Cotton Exchange, now a welcome center. Recently, public/private partnerships have created a local history museum and preserved a number of important landmarks, including the boyhood home of President Woodrow Wilson. Augusta is further developing its heritage tourism potential by promoting two sites as part of the first Civil War Heritage Trail in Georgia. Of particular note is the Augusta Canal National Heritage Area, featuring the Nation's only industrial power canal still used for its original purpose. Built in 1845, it was nearly drained and used as the course for a planned superhighway in the 1960s. Realizing the development potential of the canal and its remaining mills, the community partnered with governmental, non-profit, and private organizations to restore related trails and structures. Recently, following a $15 million restoration by a private developer, the historic Enterprise Mill opened for a variety of uses. 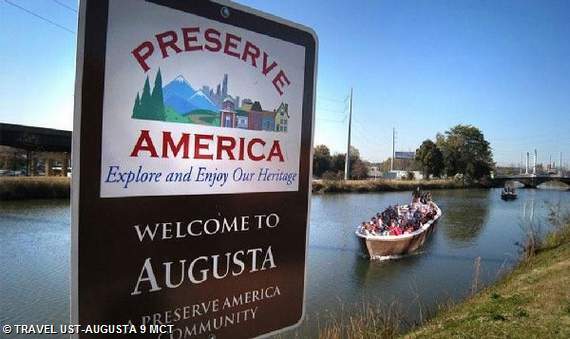 Among those uses is the Augusta Canal National Heritage Interpretive Center. The center features hands-on exhibits depicting canal construction and mill life that, along with two reproduction canal boats funded with transportation funds through the Georgia Department of Transportation, are extremely popular with school groups as well as the general public. The canal was declared a National Historic Landmark in 1978, and a National Register Online Travel Itinerary of the area is now under development.